Usage: 50 mile round trip commute, some freeway speed, some stop and go. Thoughts: Pretty happy with the wear metals but glad I changed it, don't want vis to go any lower on this engine than 8.0 as it has known weak connecting rod bearings. Replaced with: M1 5w30, OEM filter. 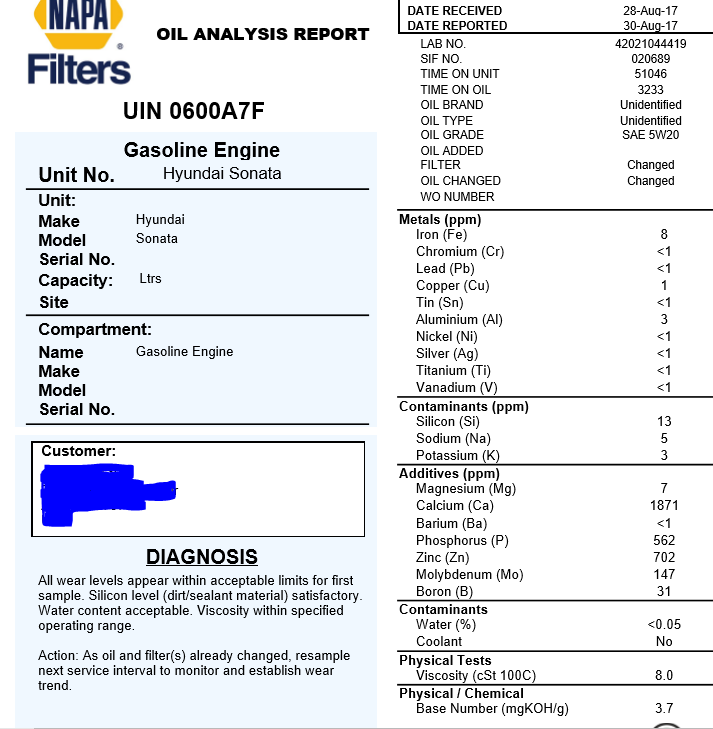 2012 Hyundai Sonata GLS 6MT 2.4GDI, ProDS 10w30, XG9688 filter, 2018 Mitsubishi Outlander SEL 2.4 CVT, Factory fill still. the bulk oil was doing good, M1 should go more than x3 though. Good choice on the M1 5w-30 , dont go too long on the oil though. The Theta II engine will beat the snot out of oil, heavy fuel dilution. Go conservative with the oci on this engine. KIA certified Senior Technician, Hybrid certified. That's the plan. I think 4000-4500 tops on the M1. We'll see where we're at then. You'll be fine going 5K with any brand name synthetic. Anything less, a top shelf Conventional or Blend would do. I have 29 5 quart jugs of Chevron Havoline Pro DS in 5w20, 5w30 and 10w30 from the O'Reilly's clearance. The 5w20 will be going in my fiance's Dart, the 30 weights in the Sonata. I've had good results with Chevron oils in the past, I hope it's the same with this one because I have a metric ton of it. I could be wrong but I'd bet money this is Cam2 oil. Another member here had gotten dealer service and it was Cam2 there as well. It is actually quite good oil at the end of the day. That dealer bulk did it's job, all wear numbers low and ample TBN left (3.7). That's decent moly at 147 ppm. It may be dealer bulk but it looks like a good oil. I agree, and as you mention, TBN condemnation levels appear to be many miles down the road. The, at temp, viscosity number at 8, after this 3300 mile run, for an XW20 oil that probably began somewhere in the 8s isn't a concern, in my opinion.